1Preheat oven to 400 degrees. Remove the tops and roots of the beets and then peel each one with a vegetable peeler. 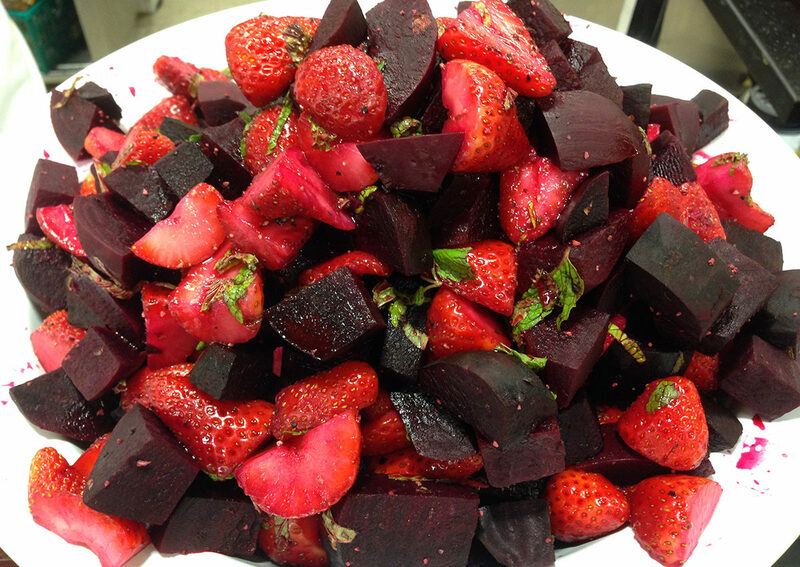 Cut the beets into 1½" chunks (roughly the same size of the strawberries). Tip: wear a pair of disposable food gloves so you don't stain your hands; if you don't have any, your local deli might be able to spare a set! 2Place the beets in a bowl along with the olive oil, toss, and then transfer to a baking sheet. Sprinkle liberally with salt & pepper. Roast for 35 - 40 minutes or until fork tender, but still slightly firm. Cool thoroughly. 3In a large salad bowl, combine the beets with the strawberries. Drizzle with KISS® until thoroughly coated. Allow the mixture to sit for at least 15 minutes while the flavors marry. Garnish with fresh mint leaves and serve at room temperature.